Many people kick their morning off with a hot cup of coffee, and some may add flavorings, including soy milk. Drinking coffee and soy milk together may be bad for some people, although it provides nutritional benefits as well. Be careful of how you add the soy milk to the coffee, though, or you could wind up with an unpalatable beverage. 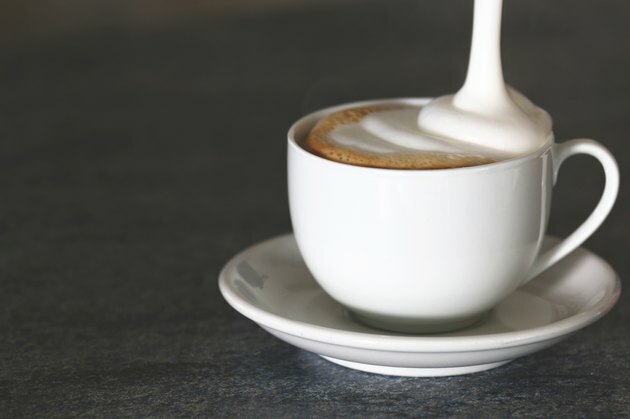 Drinking coffee and soy milk together may not be a good option if you suffer from a soy allergy, which the Mayo Clinic website indicates is common. Most symptoms are not life threatening and include hives or irritation around the mouth. However, extreme allergies may trigger breathing problems that can result in death. Soy allergies are most common in children, but adults may experience soy allergies as well. Even the small amount necessary for use in coffee can trigger an allergic reaction. Drinking soy milk and coffee together may decrease your chances of having a baby. A study published in the June 2010 issue of "Molecular and Cellular Endocrinology" notes that dietary soy products, such as soy milk, decreased sperm mobility and sperm count. The research was performed on rats, so human research is needed to confirm the findings. For women, it's the coffee, not the soy, that may reduce fertility. Interactive parenting network Baby Center points to evidence that drinking coffee may reduce chances of conception. Consider cutting back on soy milk and coffee while you're trying to conceive. Coffee contains caffeine -- an 8-oz. cup has 95 to 200 mg. Even decaffeinated coffee contains a small amount of caffeine -- 2 to 12 mg per 8 oz. Soy milk may also have caffeine in it. One type of soy milk -- chocolate soy milk -- contains 3.6 mg per 8-oz. serving. Moderate amounts of caffeine -- 200 to 300 mg per day, according to the Mayo Clinic -- will not harm you; however, drinking even an 8-oz. cup of coffee and soy milk together may trigger a reaction if you have a sensitivity to caffeine. These reactions may include heart palpitations and the jitters. Coffee does not offer much in the way of nutritional value. Adding soy milk to coffee introduces a variety of vitamins and minerals. One fluid oz. of soy milk contains 0.07 mg of the mineral manganese, according to the USDA National Nutrient Database, of which the University of Maryland Medical Centers notes the human body requires 1.8 to 2.3 mg daily. You also get small amounts of selenium, copper, phosphorus, magnesium, vitamin K and vitamin B-6 in coffee with soy milk.